Atheists are some of the most religious and faithful people ever. It takes an incredible amount of faith to be an atheist. 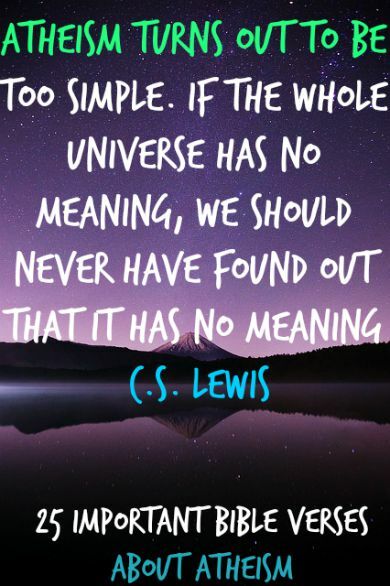 Sun, moon, stars, oceans, the Earth, animals, babies, male, female, the human heart, emotions, our conscience, love, intelligence, the human mind, bone structure, the human reproductive system, biblical prophecies coming true all before our eyes, eyewitness accounts of Jesus, and more and still there are some people who deny God’s existence. Just stop and think about it. It’s impossible for something to come from nothing. To say nothingness caused nothing and created everything is absurd! Nothing will always remain nothing. Atheism can’t explain existence. Atheists live by science, but science (always) changes. God and the Bible (always) remain the same. They know there is a God. He is revealed in creation, through His Word, and through Jesus Christ. Everybody knows that God is real, people just hate Him so much they suppress the truth. Behind every creation there is always a creator. You might not know the person who built your house, but you know it didn’t just get there on its own. Atheists are going to say, “well who created God?” God is not in the same category as created things. God is not created. God is the uncaused cause. He is eternal. He simply exists. It is God who brought matter, time, and space into existence. If Atheists believe there is no God why are they always so obsessed with Him? Why are they worried about Christians? Why do they view things about Christianity just to mock? Why are there atheist conventions? Why have atheist churches? If God is not real why does it matter? It’s because they hate God! Why does life matter? Without God nothing makes sense. There is no reality at all. Atheists can’t account for morality. Why is right right and why is wrong wrong? Atheists can’t account for rationality, logic, and intelligence because their worldview will not allow them to. The only way they can is to take upon the Christian theistic worldview. 1. Colossians 2:8 Be careful not to allow anyone to captivate you through an empty, deceitful philosophy that is according to human traditions and the elemental spirits of the world, and not according to Christ. 2. 1 Corinthians 3:19-20 For the wisdom of this world is foolishness with God, since it is written: He catches the wise in their craftiness; and again, The Lord knows that the reasonings of the wise are meaningless. 3. 2 Thessalonians 2:10-12 and every type of evil to deceive those who are dying, those who refused to love the truth that would save them. For this reason, God will send them a powerful delusion so that they will believe the lie. Then all who have not believed the truth but have taken pleasure in unrighteousness will be condemned. 4. Psalm 14:1 For the choir director. Davidic. The fool says in his heart, “God does not exist.” They are corrupt; they do vile deeds. There is no one who does good. 5. Psalm 53:1 For the music director; according to the machalath style; a well-written song by David. Fools say to themselves, “There is no God.” They sin and commit evil deeds; none of them does what is right. 6. Psalm 10:4-7 With haughty arrogance, the wicked “God will not seek justice. He always presumes “There is no God. Their ways always seem prosperous. Your judgments are on high, far away from them. They scoff at all their enemies. They say to themselves, We will not be moved throughout all time, and we will not experience adversity.” Their mouth is full of curses, lies, and oppression, their tongues spread trouble and iniquity. They know God is real, but they hate God so they suppress the truth by their own unrighteousness. 7. Romans 1:18-19 For God’s wrath is being revealed from heaven against all the ungodliness and wickedness of those who in their wickedness suppress the truth. For what can be known about God is plain to them, because God himself has made it plain to them. 8. Romans 1:28-30 And just as they did not see fit to acknowledge God, God gave them over to a depraved mind, to do what should not be done. They are filled with every kind of unrighteousness, wickedness, covetousness, malice. They are rife with envy, murder, strife, deceit, hostility. They are gossips, slanderers, haters of God, insolent, arrogant, boastful, contrivers of all sorts of evil, disobedient to parents, senseless, covenant-breakers, heartless, ruthless. Although they fully know God’s righteous decree that those who practice such things deserve to die, they not only do them but also approve of those who practice them. They can’t understand the things of God. 9. 1 Corinthians 2:14 The person without the Spirit does not accept the things that come from the Spirit of God but considers them foolishness, and cannot understand them because they are discerned only through the Spirit. 10. Ephesians 4:18 They are darkened in their understanding and separated from the life of God because of their ignorance and hardness of heart. 11. 2 Peter 3:3-5 First of all you must understand this: In the last days mockers will come and, following their own desires, will ridicule us by saying, What happened to the Messiah’s promise to return? Ever since our ancestors died, everything continues as it did from the beginning of creation.” But they deliberately ignore the fact that long ago the heavens existed and the earth was formed by God’s word out of water and with water. 12. Psalm 74:18 Remember this: The enemy scorns the Lord and a foolish people despises your name. 13. Psalm 74:22 Arise, O God, defend your cause; remember how the foolish scoff at you all the day! Are atheists going to Heaven? 15. Revelation 21:8 But as for the cowardly, the faithless, the detestable, as for murderers, the sexually immoral, sorcerers, idolaters, and all liars, their portion will be in the lake that burns with fire and sulfur, which is the second death. How do I know there’s a God? 16. Psalm 92:5-6 How great are your works, O LORD! Your thoughts are very deep! The stupid man cannot know; the fool cannot understand this. 17. Romans 1:20 For his invisible attributes, namely, his eternal power and divine nature, have been clearly perceived, ever since the creation of the world, in the things that have been made. So they are without excuse. 18. Psalm 19:1-4 The heavens are declaring the glory of God, and their expanse shows the work of his hands. Day after day they pour forth speech, night after night they reveal knowledge. There is no speech nor are there words, their voice is not heard yet their message goes out into all the world, and their words to the ends of the earth. He has set up a tent for the sun in the heavens. 19. Ecclesiastes 3:11 Yet God has made everything beautiful for its own time. He has planted eternity in the human heart, but even so, people cannot see the whole scope of God’s work from beginning to end. God is revealed in Jesus. 20. John 14:9 Jesus answered: “Don’t you know me, Philip, even after I have been among you such a long time? Anyone who has seen me has seen the Father. How can you say, ‘Show us the Father’? 22. Jeremiah 29:13 You will seek me and find me, when you seek me with all your heart. 23. Hebrews 13:8 Jesus Christ is the same yesterday and today and forever. 24. John 4:24 God is spirit, and those who worship Him must worship in spirit and truth. 25. Psalm 14:2 The Lord looks down from heaven on the entire human race; he looks to see if anyone is truly wise, if anyone seeks God. Psalm 90:2 Before the mountains were born or you brought forth the whole world, from everlasting to everlasting you are God. I appreciate your passion and conviction, I truly do. Having said that, It’s unfair that you would speak on behalf of atheists based on what you suspect might be true. I hope that I can offer a more accurate perspective of what it means to be atheist. First, you’re right, there are people out there who claim to be atheists that I suggest are not and might not even understand what it means to be atheist. These are people who express anger for all the suffering in the world and attempt to blame a being that they say doesn’t even exist; an obviously ridiculous position to take. Second, most actual atheists do not hate any gods because to do so would, again, acknowledge the existence of said gods; another obviously ridiculous proposition. Third, most atheists hold dishonesty and intrusion in contempt and that is the source of most atheist anger. While I don’t accept the existence of any gods, I also don’t care. I live my life with honesty, integrity, compassion and kindness; the proven existence of a deity would not change that reality. My contempt is for the bible; written by men and attempts to control the way I live my life. My contempt is for those who wish do harm to others based on biblical teaching. My contempt is for those who would try to incite fear inside of me with the goal of forcing me to accept their beliefs. My contempt is for those who would interfere with the rule of law based on biblical teachings. I hope this helps you see the difference. I take no issue with any gods; my issues are with men who pretend to hold dominion over others based upon stories that can never be proven. I reject slavery. I reject oppression. I reject arrogance. I hope you understand that the constant arguments between believers and non-believers does nothing to bring humanity closer together. I posit that by listening to each other and trying to understand each other will serve to bridge the gaps between us. At the end of the day, we still have a planet to share.